← ModNation Racers arrives on Tuesday! Due to the never feigning fascination with ninjas, curiosity leads one to take a peek at the iphone’s 3 most popular ninja games TapTap Ninja, Fruit Ninja, and NinjaTown: Trees of Doom. In Tap Tap Ninja the camera scrolls to the right and it is up to you, the ninja, to make it as far as you can without succumbing to the elements. As you get further into the game the scroll speed increases blurring the screen and making the attempt to avoid obstacles, and collect gems, all the more challenging. There are three levels within the “Free Run” portion of the game, each requiring completion in order to unlocked and pursue the next. The levels entitled Apprentice, Sensei and Master are of the same level construct appearing in the “Gem Hunter” variation. The graphics run smoothly, but 1st gen and 3G users are advised after the title screen to turn off the music to ensure said smoothness is maintained. The controls of this game are as easy as it gets; tap once to jump and again while in the air for a double jump. This is all you need to remember to be successful and the tap timing ratio is as accurate as any other tap controlled game out there. Overall Tap Tap Ninja is a great way to hone your ninja speed while collecting precious gems and using your ninja reflexes to avoid disastrous outcomes a game for ninety nine cents which you will not regret parting with. Are you ready to use that ninja sword you have hanging above your mantle? Well, what are you waiting for? Go grab it and join me in ….the kitchen? Fruit Ninja is a game of reflexes and gives you the opportunity to slice up all kinds of fruit with splattering authority. As the game begins you are faced with a wooden wall that contains nothing more than a few shadowy scratch marks and before you know it fruit is being tossed into frame from below. Slide your finger across the fruit to slice it and allow it to fall off screen in what I can only imagine to be the biggest messiest bowl of fruit salad on the planet. The controls are smooth, graphics rich and vibrant and points are awarded for each successful slice of the sword but be sure to avoid the bombs because one slice into the bomb means doom for all and the end of your fruit salad! Fruit Ninja allows for online competition through OpenFeint and divulges a world of leaderboards and achievements. Fruit Ninja is easy to use, pretty to look at and has as much online capabilities as an app can expect but you may find that its simplicity equates to repetitiveness and the game grows tired quickly reducing the replay factor of Fruit Ninja significantly. 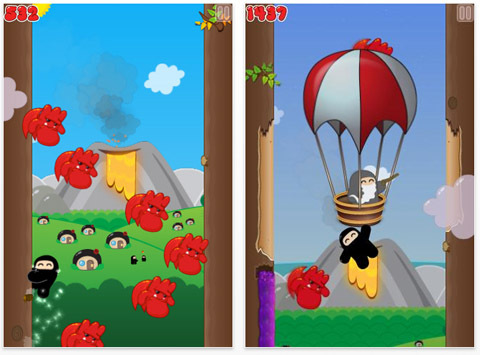 © 2010 Venan Entertainment, Inc.
Wee Ninja recently leapt from Ninja Town on the DS, a tower defence title you may be familiar with, and into your app store with this jump interpretation, Trees of DOOM! The compellingly cute character is found in our title screen sleeping at the foot of a large tree until you select play and he jumps to attention ready for action. Your Wee Ninja is then able to jump up the trees higher and higher while asked to avoid many challenges and collect bonus items. The controls are straight forward and ask you to tap your way to the top. Tree branches are offered to catapult you longer distances and a guidance arrow helps you to calculate your range from enemies or other aspects you wish to avoid. As you climb higher your challenges become more difficult and a level of patience and timing become part of your strategy for this you are rewarded with small celebrations of achievements. The replay value of this game comes from the ability to share your score with your friends via Facebook or Twitter but having to restart with a significant drop in ‘level’ and build your way up through the easy areas can be perceived as a test to your patience and determination. Overall Trees of Doom is a great way to ninja jump your way to the top, it has excellent replay value and the characters and graphics are cute as a button! For $0.99 in the app store you too can be a Wee Ninja and brag to all your social networking friends with NinjaTown: Trees of Doom! So while the world has turned vampires and zombies, don’t toss away your shuriken just yet; get into your app store and check out some of these, and other, titles to satisfy that ninja blood lust.